Although Janet wanted others potters to use Bernard's personal seal once he had stopped potting, I have seen no evidence that it ever happened. 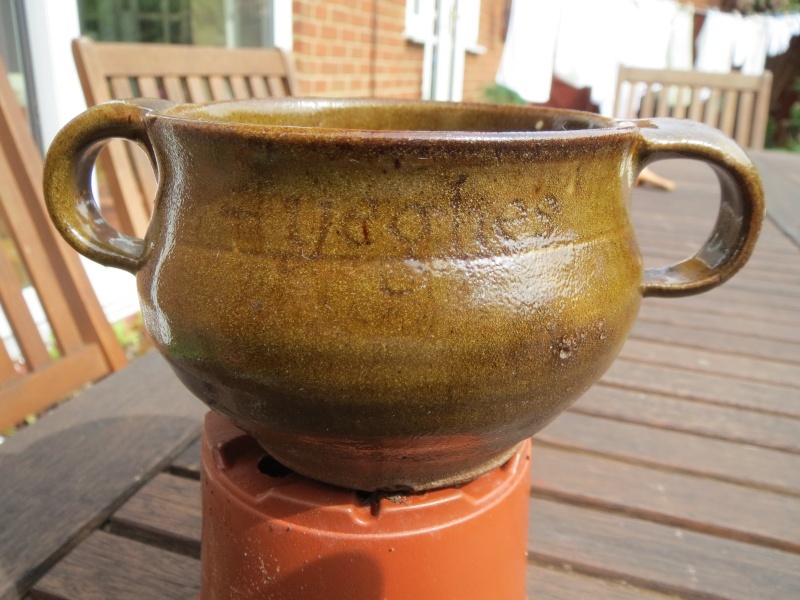 I think that it is common knowledge that Bill Marshall was largely and on occasions solely responsible for making some of Bernard's larger pots but I think that it is safe to say that your little pot was made by Bernard. 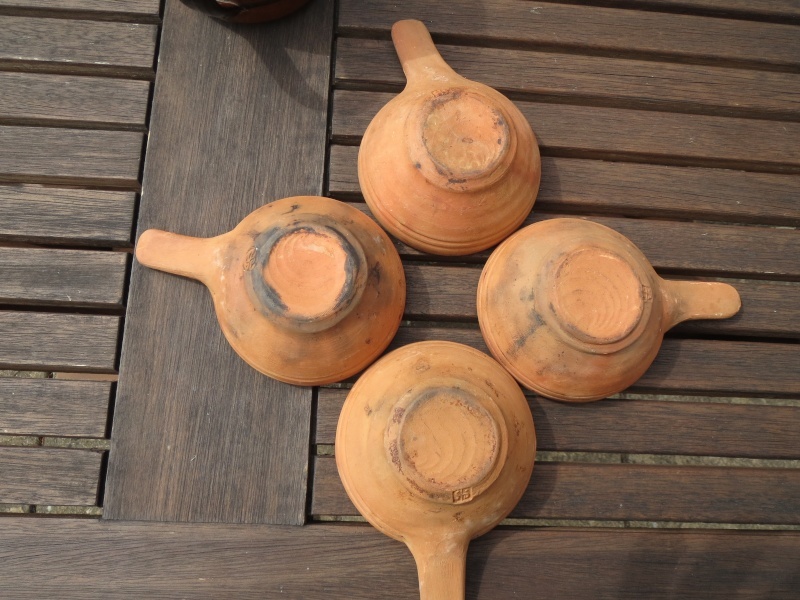 I think that he was a reasonable thrower but his pots did become increasingly heavy as he got older. Yes. 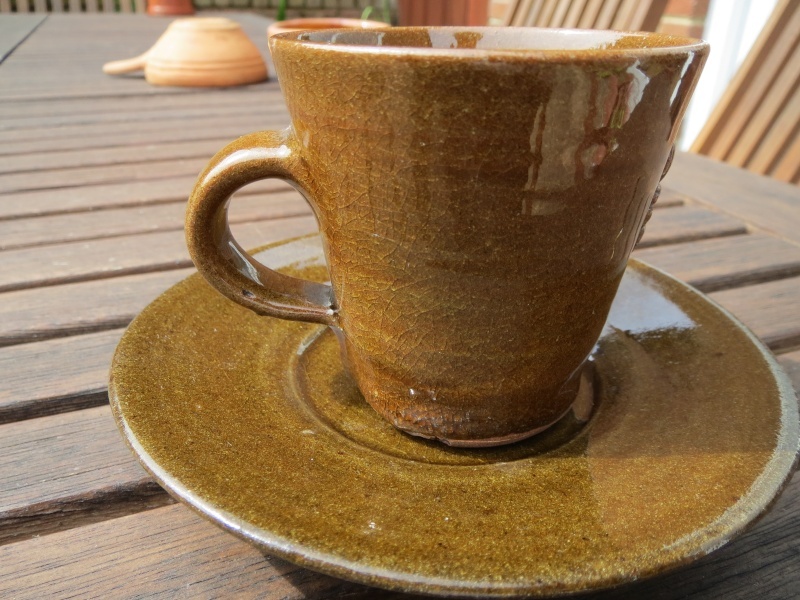 I have a little standard ware jug and it's beautifully made and glazed. Another example of a porringer, I'm led to believe it is not unusual for them not to be stamped? I hope so! mowen wrote: Another example of a porringer, I'm led to believe it is not unusual for them not to be stamped? I hope so! Items of Standard ware would normally have the impressed St. Ives seal but stamps always get missed, especially on items that are the responsibility of more than one person. 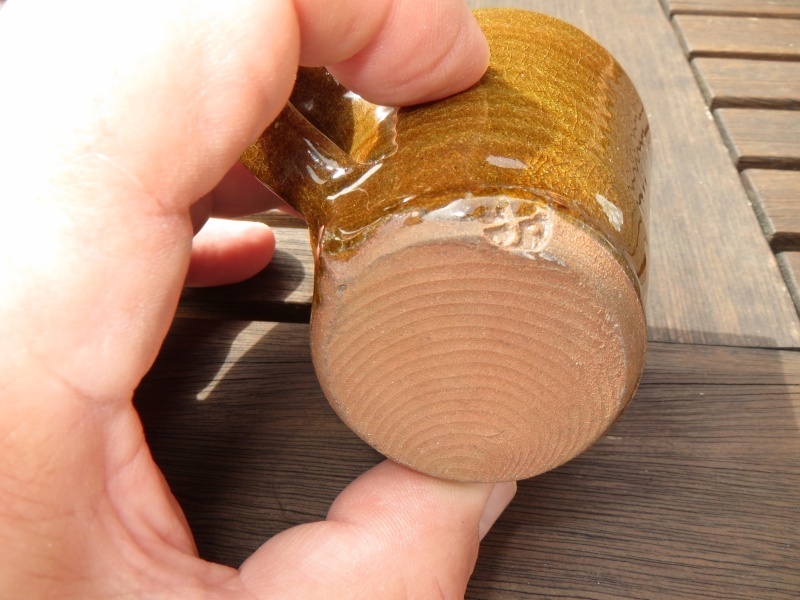 Your bowl looks fine, even if it has no stamp, but a little less easy to sell. 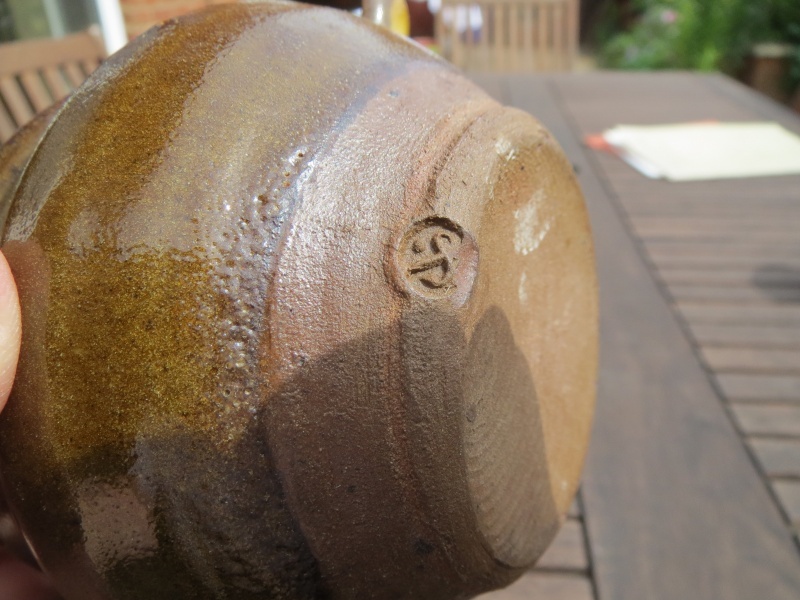 They were making for over 70 years (I don't regard the current operation as being the Leach Pottery) and each potter would most likely have had at least one St Ives seal and some even more so not surprising. 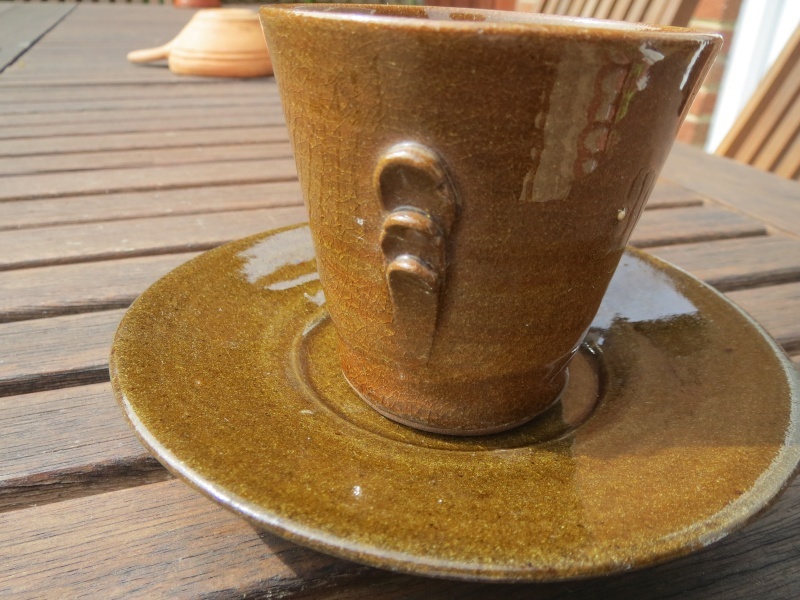 Just came across an image of a Leach Pottery earthenware mug/tankard from the late 1920s/early 1930s that I kept for a number of years. 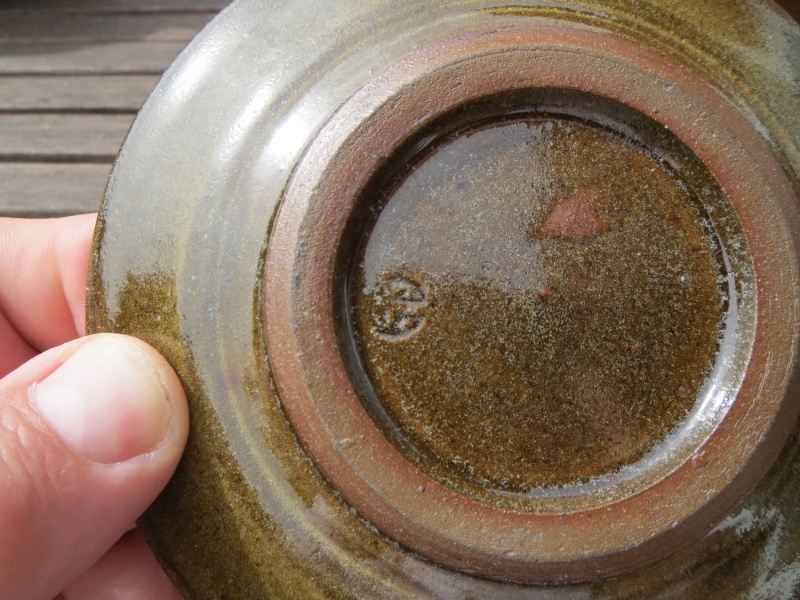 I have mentioned elsewhere that I do shy away from pots with damage but with earthenware I seem to be able to tolerate small nibbles and glaze flaking as this has. 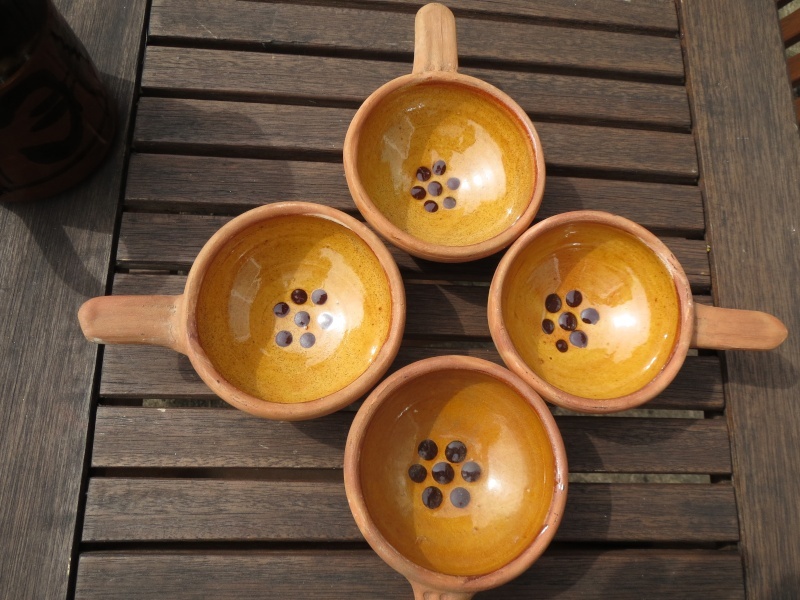 These are a group of four Earthenware small handled bowls. I suspect they are from the 20's,as the Earthenware clay colour is a lot different from pieces from the 30's. 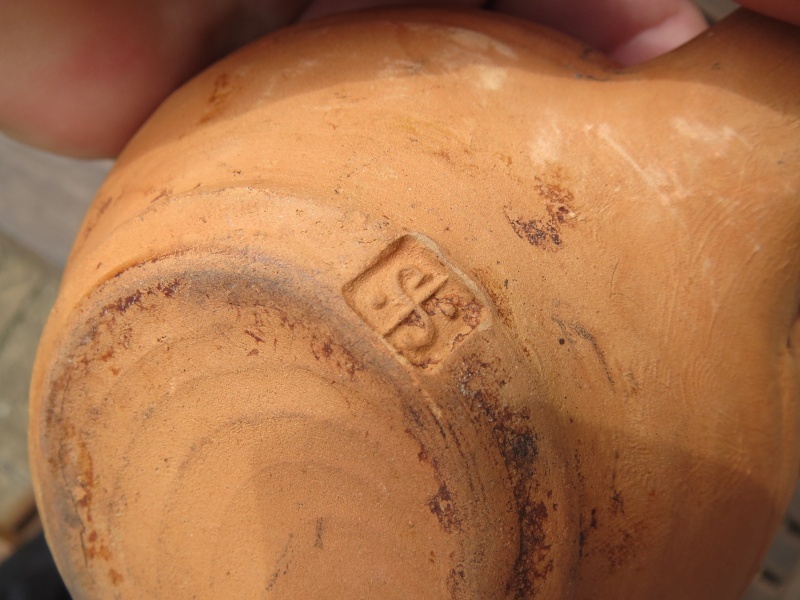 One does wonder how the pottery survived in its early years.The quality is not tthat good! The reverse of the same pots. The mark on one of them. A small earthenware bowl,probably from the 30's.The earthenware clay is darker. The reverse of the above bowl. Another view of the same cofee cup and saucer. The reverse of the cup. And the bottom of the saucer. 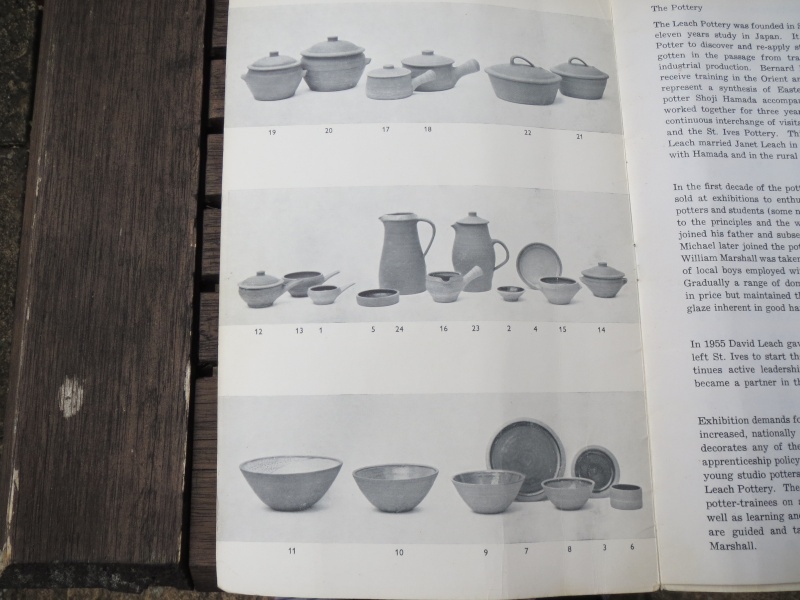 The immediate decade after the Second World War.was probably the Golden Age for the Standard Ware of the Leach Pottery.In age of True Austerity -ractioning did not finish until the mid 50's- they could sell all they produced. 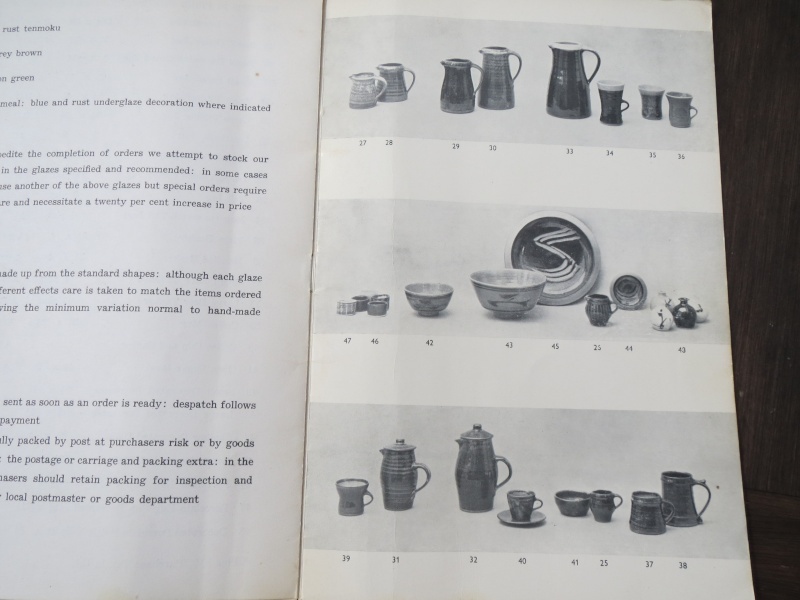 David Leach had rationalised both Clay and production,and that period of the 'Oak Leaf' standard ware production in the late 40's early 50's was probably the zenith of Standard Ware at the Leach Pottery. 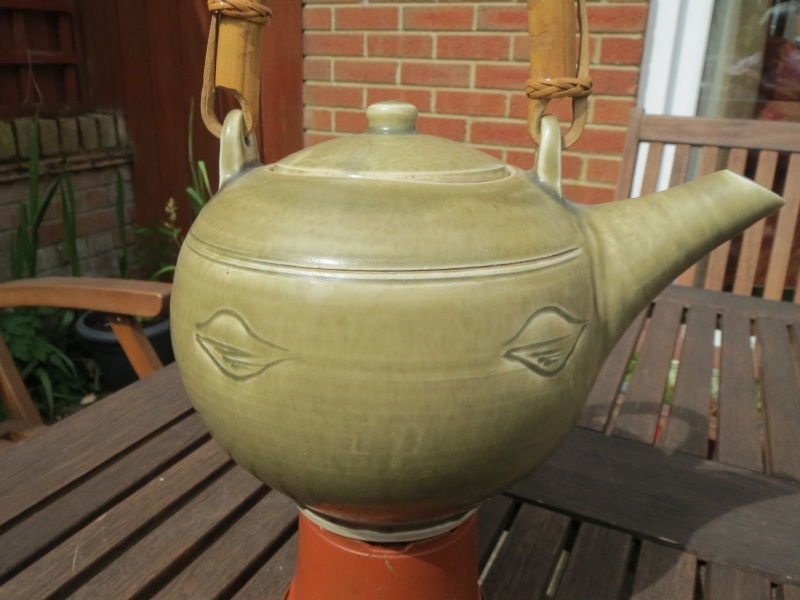 Teapots in particular seem quite rare. They were made to order,so inevitably are uncommon. There seem few images around. 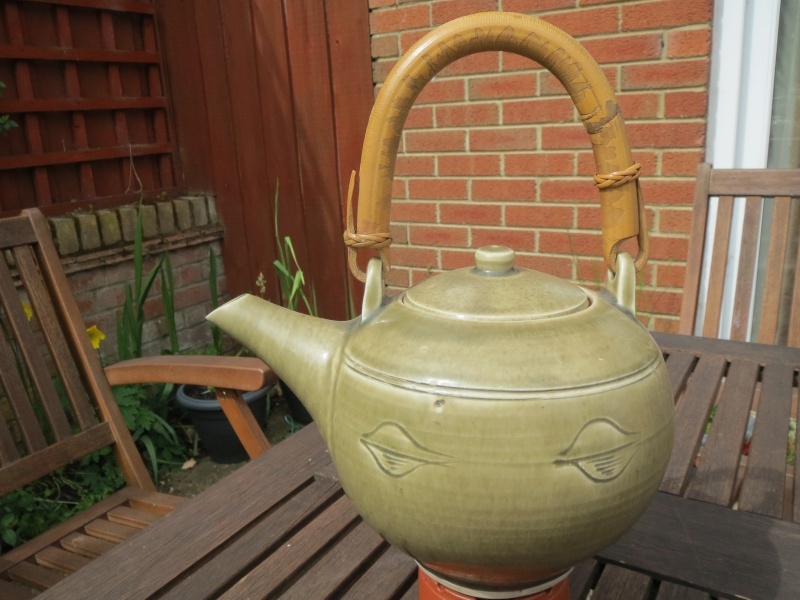 This standard ware teapot is from the 'Oak Leaf' range circa late 40's/early 50's. 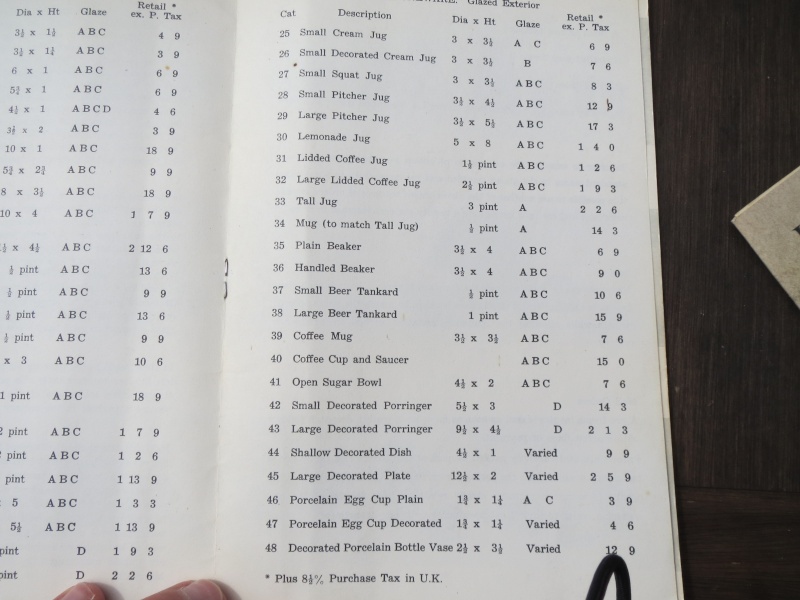 The following are the pages of a Standard Ware catalogue from circa 1960. ~4.5" dia bowl. 7" including handle. 2.5" high. 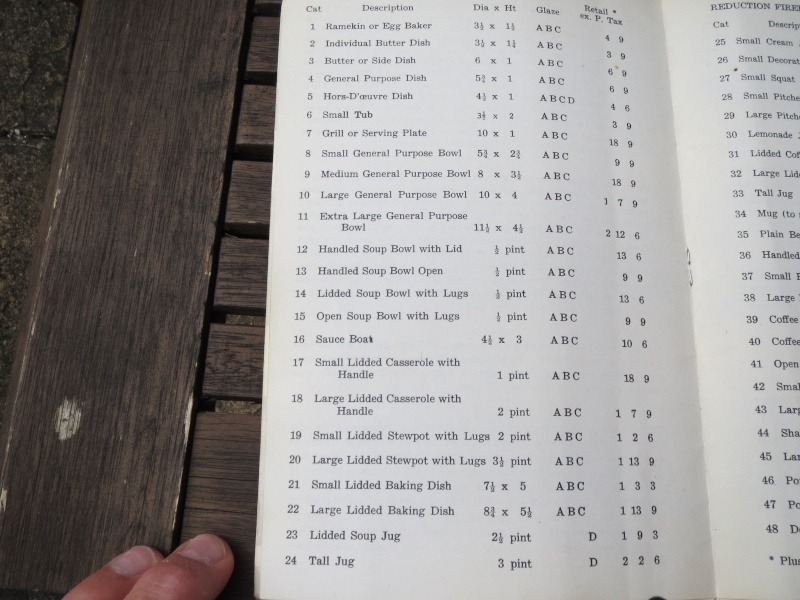 I believe there's a photo of one with this shape in the catalogue, above - No.13 Handled soup bowl open. 1/2pt. From the catalogue = No. 42 small decorated porringer.